Resting on an inland plain in Chile’s Central Valley, with the Andes glimmering in the distance, Santiago de Chile boasts one of the most dazzling backdrops of any capital city in the world. Home to nearly 6 million people and the fifth largest city in South America, it has all the characteristics of a true metropolis, from its modern subway to its high-rise towers. Ancient and modern stand side by side in the heart of the city, the downtown area is dotted with Spanish colonial buildings and old churches, while other neighborhoods house international restaurants, upscale boutiques and an active nightlife which rivals any of the continent’s other major cities. For stunning views of the city and its surrounds head to the top of Cerro San Cristòbal (San Cristobal Hill), accessible by bus, cable-car or a vigorous hike. Whilst many tourists use Santiago simply as a gateway to visiting some of Chile’s other jewels, the greater region of Gran Santiago is home to over a third of the country’s population, making the city a great introduction, and a must for those wishing to get an understanding of the country they are visiting. The city is also the central point of a region bursting with attractive sites and activities. Only 60km away, the imposing Andes peaks are home to South America’s major ski centers, whilst the beautiful beaches of the Pacific are only an hour’s drive to the northwest of the city. Just south of Santiago lie the rich and beautiful vineyards of the Maipo Valley, one of the world’s most esteemed wine producing regions, where the numerous wineries welcomingly open their doors for visitors. Santiago’s weather is mild. In summer temperatures can reach 30 Celsius, while in winter there are heavy but short rains and the temperature average is 9 C. Snow falls in the mountain area of the Andes where there are several internationally famous ski resorts, starting by mid June taking place until begB&B/Innings of October. Santiago are best enjoyed September to April, but it can be quite hot and smoggy from December to February. Ski resorts are open June through September. Most of the travelers spend in Santiago two nights as it is not a top attraction for Chile like it is Buenos Aires for Argentina, people mostly spend nights due to airline connection purposes or visiting Valparaiso or Vina del Mar. Major airlines fly to Santiago de Chile International Airport from all over the Americas, Europe, Australia and South Africa. You can access Santiago by plane from Rio de Janeiro (h), Buenos Aires (2h), Lima (h), Sao Paulo (h), Calama (h), Puerto Montt (h), Punta Arenas (h), Easter Island (h), among others. 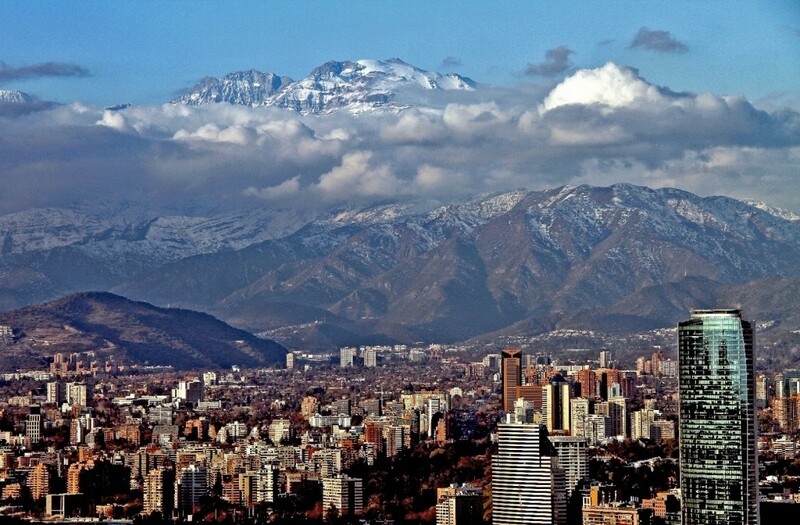 By land, you can access Santiago from Mendoza in Argentina and several cities in Chile. Several Cruise Lines get to Valparaiso. By Metro — Cheap, clean, and efficient, the Metro is the preferred mode of intercity transportation. There are three Metro lines. Line no. 1 runs from Providencia to west of downtown along the Alameda; this is the most convenient line that will take you to most major attractions. Line no. 2 runs from Cal y Canto (near the Mercado Central) to Lo Ovalle. Line no. 5 runs from La Florida to Baquedano, with a stop in the Plaza de Armas. At print, two new lines had yet to be finished, but the routes are to outlying residential areas that do not benefit travelers. There are two fares, 45¢ and 60¢, depending on the time of day (fares are posted in the ticket window). Visitors can buy a Multiviaje card and charge the card with any amount; fares are 20 pesos cheaper, and you won’t have to wait in line to buy a ticket each time you travel. The Metro runs from 6am to 10:30pm Monday through Friday, and 8am to 10:30pm Saturday and Sunday. The Metro is safe, but incidents of pickpocket crime are on the rise. For a map, go to www.metrosantiago.cl and click on “Plano Red Metro” at the right of the page. By Bus — City buses, or micros (or the “yellow sharks”) are not worth the headache. There are no posted bus routes, the coaches themselves are old and filthy, and bus conductors are animales (and this is what the police call them!) who swerve abruptly in front of passenger vehicles, speed, and then slam on their brakes when they see a fare. Take a taxi or the Metro instead. – Chilean Pre-Columbian Art Museum. – Convent and Colonial Art Museum. – La Chascona (Neruda’s Museum). The tour starts at the city’s most important building, the La Moneda Palace, the seat of government and now fully restored after sustaining damage in the air attacks of the 1973 coup. You’ll weave through the bustling streets of the downtown area before arriving at the Plaza de Armas, which is surrounded by the 18th century baroque Cathedral, the National Historical Museum, and the Central Post Office. Leaving the downtown area, the tour proceeds to Forestal Park, passing in front of the Fine Arts Museum, modeled after the Petit Palais in Paris, before continuing towards Bellavista, Santiago’s bohemian quarter. Next you’ll ascend the San Cristobal Hill, a beautiful park dominated by a monumental sculpture of the Virgin Mary. The top of the hill offers majestic panoramic views across city, and on a clear day right across to the snow-capped peaks of the Andes in the background. Finally, before returning to your hotel, you’ll pass through the city’s modern residential neighborhoods of Pedro de Valdivia Norte, Las Condes, and Vitacura. The tour starts with a scenic drive from your hotel to the coastal city of Vina del Mar, 75 miles from Santiago de Chile. Along route you’ll pass through the fertile valleys of Curacavi and Casablanca, which burst with luscious vineyards and fruit plantations. Upon arrival at the lively beach resort of Vina del Mar, you’ll tour the Quinta Vergara, a public park which houses the Palacio Vergara, as well as the Museum of Fine Arts. You’ll then proceed to the Fonck Museum which specializes in Easter Island archaeology and contains an original Moai which was transferred from Easter Island. Next continue north to the resort town of Con-Con before returning to Vina del Mar via the coast, the fishing cove of Higuerilla, and the sophisticated beaches of Renaca and Salinas. Moving along the coastal road you’ll head on towards the port city of Valparaiso. Founded in the 16th century, Chile’s second largest city climbs its surrounding hills by means of alleyways and staircases. Next you’ll arrive at the city’s heart, Sotomayor Square, where you’ll find the Monumento a los Heroes de Iquique, a subterranean mausoleum which pays tribute to Chile’s war heroes. After lunch (on your own), the tour continues to “La Sebastiana”, one of the house-museums of the Chilean poet Pablo Neruda (Closed on Mondays). Finally before returning to Santiago, take a ride on one of the oldest funiculars in Valparaiso (Funicular Artilleria, 1898). The Concha y Toro winery, founded in 1883, is located some 50 minutes from the metropolis of Santiago. It is the largest and perhaps most famous wine exporter in Chile. The guided tour begins in the vineyards, of which some were planted by the founder himself, the Spanish nobleman (and noted winemaker) Don Melchor de Concha y Toro. During the visit you’ll witness and learn about each stage of the complex winemaking process, and of course there will be chance to sample some of the excellent products!